Scramble tofu tacos have become a staple at ours. They are super simple to make, and you can make million of variations of them. Tofu is an excellent protein source, it cooks very well, and it takes the flavor that you cook it with. When buying it, make sure you get the organic kind, otherwise it is full with pesticides and other BS. We love Nasoya products, but any organic tofu will do the job! Tofu scramble is also an excellent way to transition away from eggs! If you are looking for a quick meal that provides high protein, nutrients and zero cholesterol, this is your winner! Drain the tofu, and press with a tea or paper towel. You want it as dry as possible. But if it has a bit of water left that's ok.
Place the tofu on a bowl use a fork to crumble into bite-sized pieces. Mix the turmeric, black pepper, nutritional yeast with the tofu and set aside. Prep veggies and warm a large skillet over medium heat. Sauté the onion until golden, than add the tomato and peppers, let cook for a couple minutes. Add the tofu to the pan and mix. Let cook for 3-5 minutes, mixing every other minute. I personally don't use oils to cook, so if it sticks a bit to the pan, add a little bit of water! Warm a large skillet over medium heat, and heat up the tortillas. 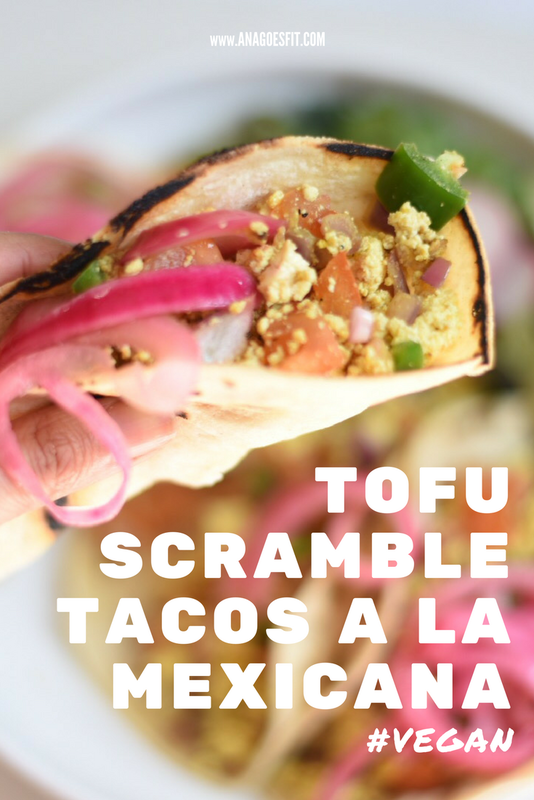 Serve the tofu scramble on each tortillas. Top ti with salsa or pickled onions. If you make this recipe, don't forget to tag me on Instagram! BLACK BEAN BROWNIE + super foods!